This column in two weeks time should be celebrating the 2008 World Champion now that Valentino Rossi has won his seventh race of the year. Yes, the Indianapolis race was shortened because the tail of Hurricane 'Ike' hit the track half-way through the MotoGP race, but the result would still have been the same even if it had gone the extra eight laps to the end. The No.46 Fiat Yamaha won it hands down. When Rossi pulled three seconds clear of Nicky Hayden in one lap, we all knew that history was being made. Rossi has now won the more races than anybody in the top class, and he has also won at every track we visit in the current MotoGP calendar. The script is endless for the still-to-be 30-year-old. Never before have we had a big race cancelled in my era up in the commentary box, but now Rossi can say that he's also won a race while in the garage! It was the right decision not to re-start the race. Sponsors' marquees were being thrown about the place and vital air fence was scooped up in the squals, leaving dangerously close walls unprotected. Three people were injured in the 65mph whirlwind that wrecked the Yamaha USA marquee. Ironically a few minutes after the MotoGP podium ceremony, the sun came out and it calmed down, but at the time of the decision and the all important live television slot, it was too dangerous to race. However, during the race Valentino Rossi had the presence of mind not to crash, and moreover. had the presence of mind not to start waving to race control during the race as he didn't want to be seen as winning 'by cop-out'. And all of this on the day his grandfather died, so his emotions would have been as turbulent as the weather. Yet another reason why he is just so good. Casey Stoner needs to score 12 points more than Rossi, just to stop the Italian winning an eighth world title in Motegi. Who would have guessed it 12 months ago that Rossi would turn the tables on Casey Stoner. Incredible. The race was a bit of an anti-climax, or was that just me? While unpacking the bulging suitcase back here in the UK, the TV was showing a re-run of the highlights and upon reflection those first few laps were very exciting; the prospect of Nicky Hayden riding out of his skin to win at home and beat teammate Dani Pedrosa would have been, as he would put it, 'sweet'. Alas it was to be second place for Hayden, but still his best finish on an 800cc bike. Hayden feels mistreated and bitter about his last two years at Honda, struggling against the other side of the garage and the associated politics. The people around him, like his crew chief Pete Benson know that Nicky's vitriolic criticism is not directed at his side of the garage. In fact, they must feel just as bitter. We had a glimpse on Thursday of 'Hayden Unleashed' when he commented on the Pedrosa split to Bridgestones. "It don't really change a whole lot other than the wall down the middle of the garage, but I mean honestly there was a bit of a wall there so not a lot's changed," he said. This is what we wanted to hear. Just imagine what he might have said if he'd won the race? Hayden should have a pretty good chance on next year's Ducati. By then the engineers will have had another six months worth of testing under their belt with the latest evolution of the electronics systems. Add to that the new all-carbon 2009 chassis that is flying around Mugello, and some extra time to find out where they can pour more fuel in and get it turning through the throttle... You just fancy it will be like David Coulthard leaving McLaren and going to Red Bull - Hayden really will be unleashed. What wasn't an anti-climax was MotoGP's newest host - Indianapolis. Everyone had been looking forward to it and everyone genuinely enjoyed it. The effort put in by the organisers was truly heroic, not just because it was going to be a world championship race - nothing compared to the Indianapolis 500 and the Brickyard 400, which draw in 400,000 people - but that they were tasked with educating people with what this whole MotoGP lark was all about. And in the end nearly 100,000 turned up in the midst of a hurricane! The race sponsor Red Bull put a massive effort in, handing out tickets to people in town and at the airport for the Thursday setup day that in itself was a full on working day for the riders as they went from auction, to interview, to stage appearance, to autograph signing. But the forethought and touches that the Indy staff did set an example to others. The way the place was branded with individual billboards above each garage with each rider's helmet emblazoned above it was just one example. Instead of saving a few hundred dollars, they got the job done and it gave a sense that they actually cared about the event. An attitude that many other circuits would do well to adopt. Sure, there were the odd hiccups. Despite only 253 acres of infield, no-one knew where to park us on Sunday, but local volunteers 'of a certain age' are going to get confused seeing strange Dorna-sanctioned season passes rather than the regular IRL or NASCAR stickers. It was amusing to see great expanses of Tarmac unoccupied. Less funny was the significant amount of 'computer says no' attitudes from attendants that required Dorna security guy assistance. The AMA Dirt track race returned to the Indianapolis State Fairgrounds on Saturday night, and it was a chance for many GP people to finally see where Kenny Roberts and Nicky Hayden, amongst others, made their name before going road racing. Think speedway, but not around a small 400m athletics track, but instead something four times the length. Think a big Harley V-Twin thumping down the straights at 125mph, with Chris Carr or the great Jay Springsteen flinging it into Turn One flat-out. And I mean flat-out. No braking - since there are no brakes. Only at the mid-point of the corner do they let off, the steel shoe out on the left, hovering inches above the ground, then getting back on the peg upon acceleration out of the corner, the front going light with all that grunt pounding through the rear-wheel. I love club motorsport; I compete in it in the UK, but to see how they do it over there was a joy to experience and a more than memorable part of the weekend. It was nearly called off as the rain had been falling like hell on Friday, but it was warm enough on Saturday for the dirt to dry out perfectly. Nicky Hayden turned up - for fun and for his fans I might add - and the crowd went mad. Nowadays too many drivers or riders won't do this and that unless paid, but I always measure where people's heart's lay by how they spend their own money to go to an event or turn up for free to plough something back into the sport. It was just a crying shame his foot was so bad otherwise you had to believe he'd have done a lap or two for old times' sake. Next time, eh Nicky? Some say there were a good seven thousand people there at the mile and I suppose looking back on it they're right. Seven thousand people drinking Bud and munching on 'dogs. It was proper Americana. Laguna it wasn't; California is as good as a separate country. 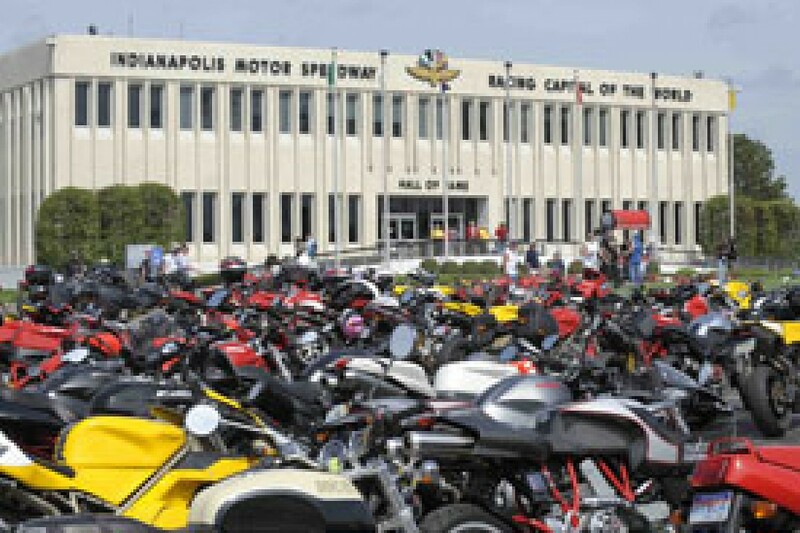 For a seven-hour flight to Chicago and a 200-mile drive south to Indianapolis, it is a new landmark for the MotoGP fan.